Directly following the release of PISA 2015 results, Asia Society in Manhattan hosted a panel discussion with Dr. Andreas Schleicher of the OECD Program for International Student Assessment (PISA) and representatives from three of the highest scoring nations. Below is a recap of the event, provided by one of our administrators. The BASIS.ed network of schools has consistently outperformed U.S. and global peers on school-based assessments designed by the Organization for Economic Co-operation and Development (OECD). The OECD is the organization responsible for the Program for International Student Assessment (PISA) designed to evaluate education systems worldwide. On the heels of the 2015 global PISA Exam results announced last week, Asia Society, which is an educational non-profit in Manhattan that promotes mutual understanding and partnership for people and organizations in Asia and the United States, hosted a panel discussion featuring Dr. Andreas Schleicher, Director for Education and Skills of the OECD and "driving force of PISA," as well as representatives from three of the highest scoring nations. Key insights from the discussion reinforce why BASIS.ed schools consistently perform so well on OECD school assessments. The discussion explored 2015 PISA results and what countries have done to address key issues such as raising the bar for science instruction and education equity. Below is a recap from the captivating discussion that only scratches the surface of the deep insights offered by the OECD and this year's PISA Exam results release. 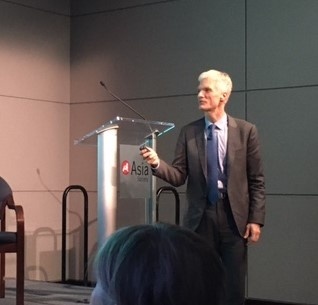 Dr. Schleicher (introduced by the Asia Society as the driving force in continuing PISA's evolution as an authentic assessment of performance and the world's most tireless advocate in using data to inform education decisions) explained that the 2015 focus for PISA was science. He noted that while the world has changed rapidly with technology, education has not kept up with the pace of change. Dr. Schleicher explained that forces of technological advancement and rapid globalization are creating demands for a much broader skill set from workers, and he said education systems must respond. Achievement in science is defined by PISA as a measure of the capacity of students to confront some of the most complex challenges that humanity faces today, and to "think like a scientist." In countries with high levels of achievement in science, most students – not only those who choose to pursue scientific careers – have a basic understanding of science that will help them become informed citizens in a world increasingly driven by both science and technology. In science, U.S. students demonstrate an interest in the area, but they do not perform well compared to students in other countries. 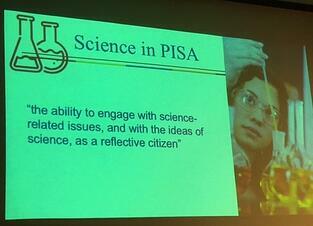 Dr. Schleicher commented that science is a field where you need to build a knowledge base. He also cited PISA results showing no gender difference in terms of skill set, but there were divergent attitudes among 15 year-old boys and girls. Health professions proved very popular with girls in the U.S., while engineering and research professions proved more popular with boys. One data point of particular interest came from diving deep into performance and intent to enter science-related careers among the top performing nations. Students in Finland, Singapore, China, and more tend to perform at the top in science but are among the least likely to want to become scientists. One very promising insight from 2015 results highlighted by Dr. Schleicher was that data demonstrated students can do well across all social backgrounds. When diving into the data, he said it is clear that the lowest performing students in Singapore would have outperformed the the top performers of many countries. Equity in education means that opportunities to gain knowledge and skills are independent of students’ backgrounds. The idea is that outcomes reflect the abilities and effort of students as opposed to their personal circumstances. Raising disadvantaged students is the one PISA measure where the U.S. has made the most progress within overall average results. 1-Commitment to universal achievement – “A commitment to education and the belief that all students can succeed,” explained Dr. Schleicher. 2-High performing countries focus resources where they matter most – Invest in strong teachers and teacher-student ratio. 3-High performing countries are clear on what is good performance – Viewed as “rigor and focused instruction” that uses students’ time better in the classroom. 4-Coherence of policies and practices – “It is one thing to set standards, yet another to roll them out consistently,” remarked Dr. Schleicher, citing the Common Core. The most successful education systems, according to the PISA results, are those that combine high levels of achievement and high levels of equity. Dr. Schleicher told the audience that there are some tools we can learn from Asia. Representing Singapore, Lee Sing-Kong, the managing director of Singapore’s National Institute of Education International, shared details on factors leading to his country's consistently strong performance on PISA. He stated that the Singapore Ministry of Education consistently champions high academic standards and also recognizes that students from “dysfunctional” backgrounds needed more support. He told the audience that Singapore had created government-funded “student care centers” to provide extra care and attention outside of school. 1-Confident person – Students with the confidence to confront constant change and become part of it. 2-Resilient, self-directed learner – Graduates will need to learn and learn and relearn. Skills become obsolete quickly. 3-Active contributor – Students see their success as due to the support of society. They feel they need to give back and, therefore, build a caring society as well as economic growth. The OECD has its sights set on focusing the 2018 assessment on measuring global competency. Quoting the Asia Society's own blog post covering the event, "the introduction of assessments of global competence is critical to measure how well students are prepared for a global world," said Schleicher. 'Globalization is everywhere. No one is exempt.'" 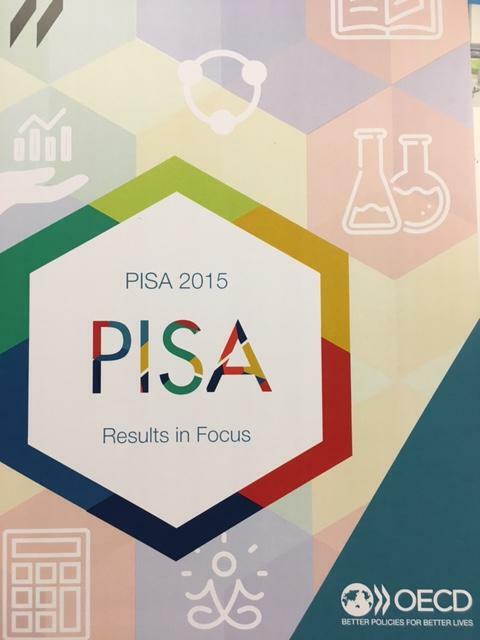 The PISA 2015 survey focused on science, with reading, mathematics, and problem solving as minor areas tested. Approximately 540,000 15 year-old students sat for the assessment in 2015 across 72 countries. Both multiple-choice and open-ended questions were included. In the 2015 PISA assessment, the United States ranked 19th in science, 20th in reading, and 31st in mathematics. In science and reading, there was no statistically significant difference between performance in the United States and the average performance across the OECD, while in mathematics, PISA consistently shows that performance and equity in education opportunities and outcomes are not mutually exclusive. In February 2017, the OECD will release an online case study of the BASIS.ed network of schools as part of the PISA4U initiative. Read more about BASIS.ed participation here. Curious to learn more? Join us at an upcoming event.